I thought I would take a little time to go into further detail on our daily activity/circle time routine this year. I mentioned in my post last week that we have expanded calendar to include more writing and weather to include a discussion of temperature, and to also talk about time. We are still doing lots of singing because Nora loves it and I feel like it is a good way to transition into school and between activities. I think I will be very sad the day that Nora tells me she doesn’t want to sing during school — I actually love singing and circle time that much! Hopefully, that is a long way off. It works best with our schedule to not begin until after lunch, typically around 2 pm. (You can see an image of our daily routine chart on my Facebook page.) I try to time it so we can start school during Zara’s afternoon nap, but if she is awake then I give her some toys and sit her in circle with us. Zara really enjoys the singing and watching us during our “three minute yoga breaks” or dance/movement portions. I think being able to expose her to school and have her participate in even a very small way is one of the great benefits of homeschooling — all of our younger children will grow up in an environment celebrating learning. Before getting started, I always make sure to have Nora go to the bathroom and to get both of us large glasses of water to reduce the chance of distraction. Then, we sit on the carpet near our big pocket calendar and get started by singing “Good Afternoon to You” (to the tune of “Happy Birthday”). We sing to each of us and to our dog; sometimes we sing to stuffed animals or dolls or objects around the room — whatever will get Nora engaged and excited. Today for example, she thought it was hilarious to sing “Good afternoon, dear Mama’s ears.” Silliness is perfectly acceptable in our classroom, as is laying on the carpet while you learn rather than always acting like a good little soldier. Nora doesn’t sing this song, but she does do the movements. Depending upon her mood, either Nora or I will point to the days of the week on our pocket calendar as we sing them. A lot of the times, she points to the days and claps but doesn’t sing. She doesn’t always want to sing the songs herself (which is typical of how she has always interacted when we went to music time and play groups on Nantucket or story time here). I keep singing songs anyway and don’t try to force her to sing. She definitely enjoys just hearing the songs because she often volunteers that we have to sing song xyz next and I hear her singing the songs sometimes during play, so I know she is learning them. Given my little one’s personality, I have learned to just keep going with the routine and allow her to join in verbally when she wants to rather than try to force a particular behavior or participation; forcing participation is the surest way to make school stop being fun for the day. adds a tally to her tally sheet, traces the day of the week on individual sheet, finds and colors in today’s date number, and writes the day’s number both as a number and a word (I write the word on the dry erase board for her to copy, as you can see). 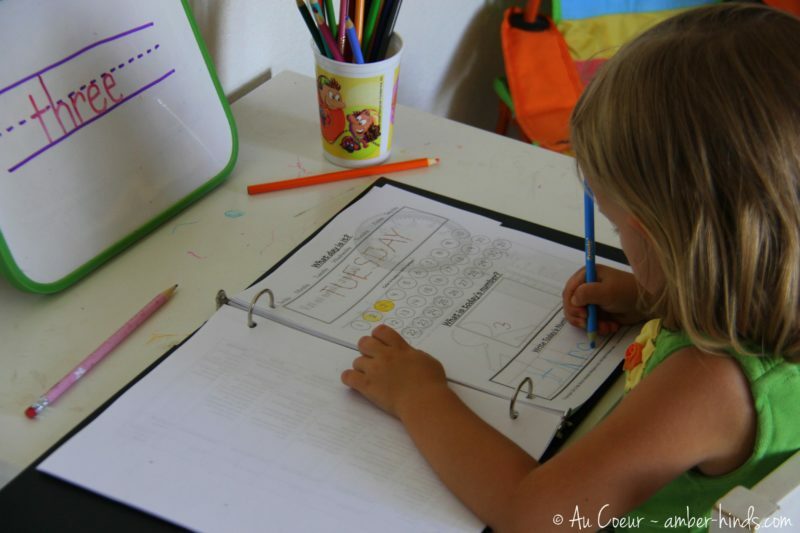 For now, I am using the daily sheets from Confessions of a Homeschooler’s preschool curriculum because I thought those that came with the kindergarten curriculum were a little too advanced. 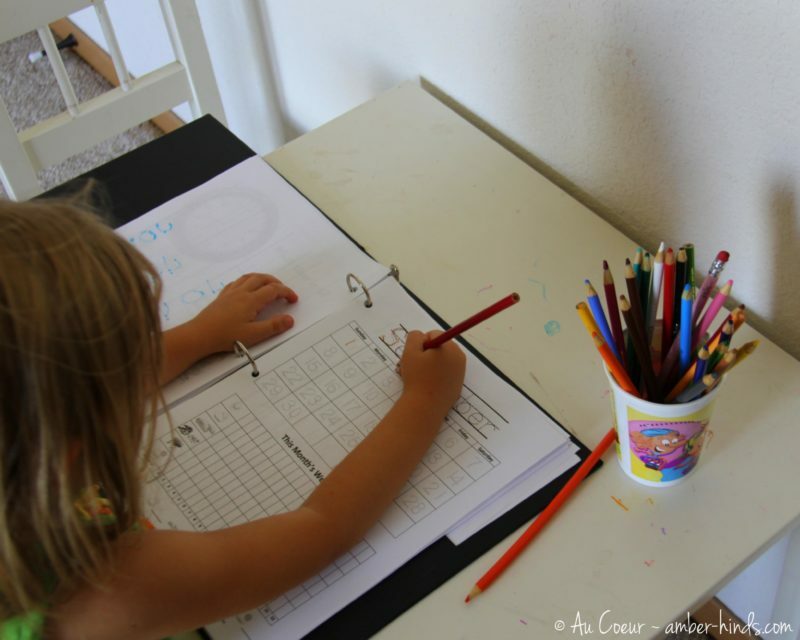 The preschool daily sheets can be downloaded for free here (they are part of a bigger packet). Her preschool monthly calendars were out of date and I thought she would prefer to trace than write, so I made my own. They have the name of the month and the date numbers for tracing on the top half, plus a space for graphing weather on the second half. Here are September, October, November, and December if you want to download them. What’s the weather? What’s the weather? What’s the weather like today? Is it foggy, partly cloudy, is it raining or is there snow. Is it windy, is it cloudy or is there sunshine today. 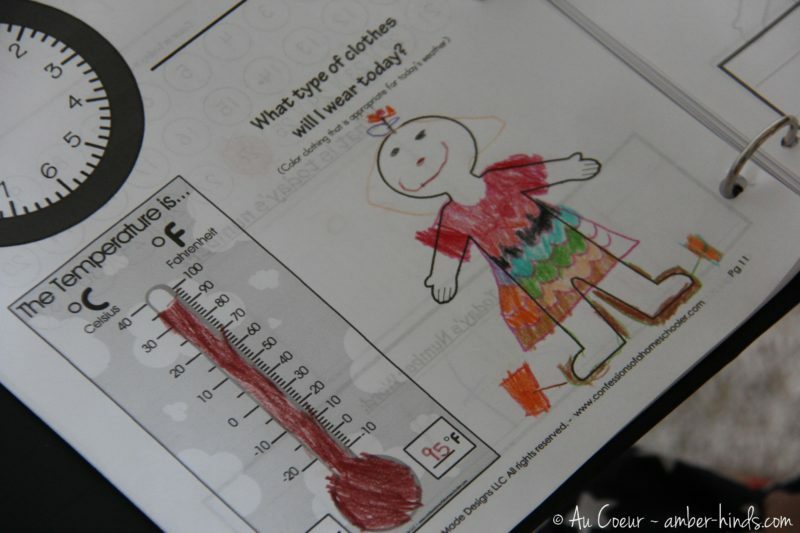 Nore looks outside and tells me what the weather is like, then puts a weather card on the weekly weather chart (shown hanging over the pocket calendar in the photo above), colors a square on her monthly weather graph, reads and records the temperature, and draw clothes on the image appropriate for today. This worksheet is printed on the back of her daily calendar sheet and is also from Confessions of a Homeschooler. The weekly weather chart is something I made, inspired by the CoaH weekly weather chart. Because we do school 6 days per week, I made a chart that shows all seven days instead of just Monday-Friday. Also, the weather icons match the icons used on the monthly weather graph. I laminated the chart and the icons and stuck Velcro circles to them so that they could be used repeatedly. You can download the weather chart here. I can tell time on the clock. I watch as the second hand goes tick tock. The small hand tells the hour. The big hand tells the minute. Each time the big hand moves, the time’s a little different. When the big hand’s on the top, it’s ______ o’clock. When the big hand moves on down, it’s _____ thirty. After saying the chant, we look at our clock and record the time by both drawing the hands and writing. Now that I have moved journal time to be part of our bedtime routine, time is the end of our daily activities. After doing all of this Nora takes a 15 minute break before we do some activities from the kindergarten curriculum I bought from Confessions of a Homeschooler. Will you have calendar printables for next year?